Tempered glass is generally less flat than standard float glass. Tempering process involves heating and cooling quickly the glass panes moving on rollers, and this causes small wave-like distortions on the glass. The amount of distortion depends highly on glass type and tempering process fine-tuning. On a glass facade, distortions become very visible as other objects with straight lines, such as neighbor buildings, are reflected on the facade. This is illustrated on the picture on the right. We propose here to evaluate the influence of tempering distortions depending on glass type, especially with coated glass. For this study, we used our classical city test scene, mixing modern medium-sized glass buildings with classical stone buildings. At first, we try to simulate glass distortions on a standard double glazing unit, made of two float glass panes, with 15mm spacing. For this, we applied a sine wave distortion function to the glass. This wave has a 25cm period, and is oriented along z axis. The orientation of the distortion waves is slightly randomly tilted on a pane-by-pane basis, as glass pane are not perfectly aligned with conveyor rollers when introduced in the glass furnace. We assumed that all panes were mounted on the building with the up-down direction parallel to the conveyor direction during tempering. The amplitude of distortion varies randomly up to 0.2 millimeters. This corresponds to deviations of the surface orientation up to 0.28 degrees, or 17 arc minutes. We chose to evaluate the effect of each pane independently. Results are shown on the two pictures below, on the left picture, only the outer glass pane was distorted, while the inner pane was distorted on the right picture. Horizontal and vertical lines are better preserved than oblique and curved lines. This is due to the orientation of the distortion waves, which are nearly horizontal. This is especially visible around the zinc-covered dome roof. The dome looks significantly better with the internal pane distortion than with external pane distortion. However, this is mostly due to the screen-printed gradient : as the black dots are not transparent, they hide the reflections of the back pane. The higher part of the dome, where the black dot density is near zero, looks similar on the two images. Internal pane distortions look only slightly better than external pane distortions in the non screen-printed areas. The importance of flatness of both panes is similar, they is no strong reason to have different tolerances on flatness. This time, we try to observe what happens when the glazing is made of an advanced low-e coated glass. For this, we used a model of double low-e solar control glass, having a blue-green tint. The coating is located on the inner side of the external glass pane. Distortions of the coated outer pane are even more visible than with standard glass. On the other hand, distortions of the inner pane (right image) is barely noticeable. This can be explained by the low contribution of the inner pane to overall reflection, due to the higher reflection coefficient of the coated glass. With reflective coated glass such as this one, special care should be taken in improving the glass flatness. On some projects with strong aesthetical requirements, use of this tempered coated glass on the outer pane may have to be avoided. 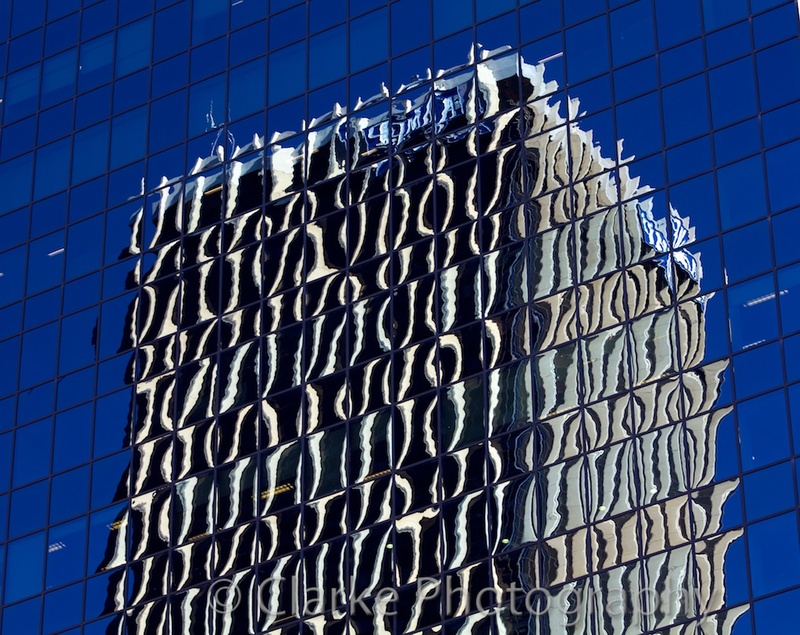 This simple study shows that distortion of reflections on glazed buildings may be simulated. Using the appropriate models and tools, building engineers can find solutions to this issue in cases where aesthetic reflections are a requirement. Simulations can assist in choosing different coatings or different shading materials, but also in requiring stronger flatness requirements for the safety glass. Depending on technical feasibility by the glass processor, one could also prescribe the use of laminated glass instead of tempered glass.